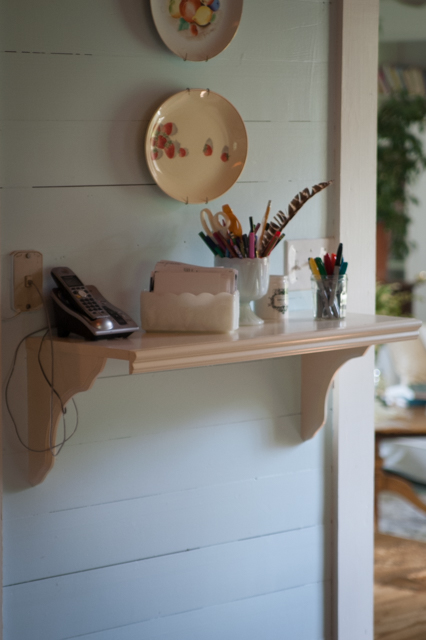 This short length of wall in the kitchen used to have a little table to hold the phone and the pens and message paper. This weekend I got a bee in my bonnet about streamlining this little space, so the table is out, and a shelf is in. 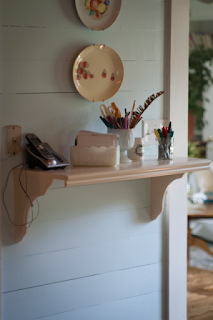 We hung it quite high--I wanted the feeling of a very old-fashioned telephone counter. I realize that having a telephone counter at all is old-fashioned, but I won't give up my land line--I've had this phone number since I was four years old, if not before. We, too, refuse to give up a landline. It has come in mighty handy during several hurricane seasons. And I find it extremely neat that you have had the same phone number for so many years. We had a party line .. we were two short rings and the neighbors were one long. Those were the days, my friend. :) I like your telephone shelf. Very much. Very nice way to streamline! Loved your comment about the phone number. We were one of the first people in our street to have a phone, over 50 years ago. When my mum died and we sold the house, I was so sad that one of the things to say goodbye to was that phone number; when I left home, I used to dial it nearly every day to talk to my parents. It's these little tweaks that make such a difference, don't they. Ps. I see you hang plates:) I do too! When we moved 3 yrs ago we chose NOT to get a landline. I miss it a LOT! I miss having the phone in the same place and being able to hear it loud and clearly throughout our home. We have 3 cell phones (2 adults 2 teens) and will probably need a 4th cell soon since my daughter will be working and if she is not home and neither my husband or I are home, that leaves my youngest at home with no phone. Crazy! There was a time when you could get by with no cell phone and then maybe one cell phone for the car for "emergencies" and now we are set up in a way that we really ALL need cell phones. Sigh. Great idea for such a "member" of the family. Quite a good idea. Tables can block a space up, this is so light and open. Love it! I love your shelf. It is a great way to still have function without the bulk. The blue wall color is lovely as well. I will not give up my landline, and whenever we move, I make sure we continue to have one. It symbolizes something to me, I guess being attached to a more secure way of life or something. I love my 'landline' and can't imagine being without it -- I just have a non-smart phone for car emergencies etc. I find that I don't call people just to talk anymore who only have a cell phone because I never know where they are going to be, grocery line, DR, etc. Oh, and your shelf looks very nice! I don't blame you. I worry about not having a landline if there's an emergency. Just this past week, having gotten fed up with so many soliciting calls, I considered getting rid of our land line. Alas, the phone company tells me our bill will go UP $15 if we remove it! thanks for a different perspective just when I needed it. This phone number represents H.O.M.E., dwelling, staying put. While we haven't had this number long (moved here 1 1/2 years ago), I do indeed remember our phone number from 50 years ago, TW2-8816. Nobody used area codes, and indeed the one black, bulky phone sat on a ledge in the hall where everyone could hear every word of your conversation - a young girl's frustration at the time but now a fond memory! It just sounds marvelous how long you have had your number. And that you were able to stay in that house, raise your adorable family there, be happy with your husband, take those lovely photos... Your life seems a dream come true! And this little shelve gave me inspiration for my own phone. I was thinking about getting a little desk or something, but this looks so much easier to care for, and you don't have to vacuum around. Thanks! As always a wonderful post about your everyday life. The same phone number? How wonderful is that?! Lovely organization. Very functional and very pretty. Manually dialing phones numbers is good for the brain, I think. I don't know the numbers that are on speed dial. Shameful. And to Wendy who commented above that she doesn't like to call to just chat with people who only have mobile phones b/c she never knows where they will be, I thought that was insightful. A phone call is always an interruption, but often a welcome one. But when you are already out doing something else, it seems like it would just be an interruption. Anyways, my parents phone number means home and that they are there, which is the real comfort.